When you embark on a Disney Cruise Line ship, you enter a world where pixie dust truly does make everything seem magical. From innovative water rides to broadway-quality theatre productions, imaginative dining experiences, and the serene beauty of the Castaway Cay beaches, there’s really nothing that can compare. But for those who haven’t cruised before, especially on a Disney ship, it can be somewhat confusing to understand where things are on the ship and how to find your way around. If you want those around you to think that you’re a Disney cruise expert, rather than a newbie, don’t forget to memorize a few words that will really help make your first cruise a smooth one. 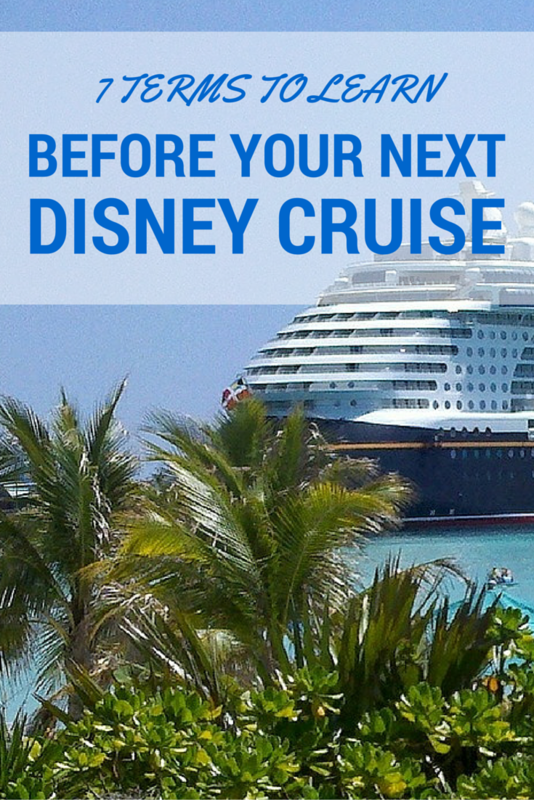 I was fortunate enough to have the real expert teach these to me before my first cruise – Andi Sims is the former cruise line expert on the Disney Moms Panel, as well as our own Disney TravelingMom. Here are seven terms that she taught me, which made me feel like I knew what I was talking about, even before I experienced the cruise for myself. To begin with, you are crossing the gangplank onto a cruise SHIP – not a boat. This one is important, especially if you don’t want to see crew members wince or shudder when you ask them where to find something on the boat ship. Ok, so they may not actually wince or roll their eyes or do anything obvious (other than provide exceptional service, of course), but I’m sure that they are probably doing so on the inside. Andi was quick to correct any member of our Traveling Mom group who let the ‘b-word’ slip through their lips. 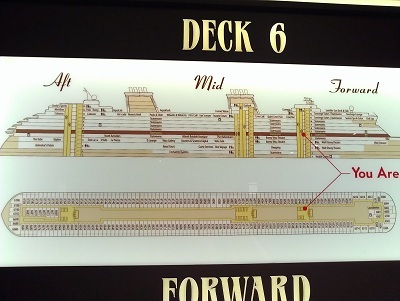 To find your way around the ship, you need to remember that FORWARD refers to the front portion, MID is the area in the middle of the ship, and the area in the rear is called AFT. So when you see that the Animator’s Palate restaurant is located on Deck 4, aft and your stateroom is on Deck 6, forward (for example) – you’ll know to wear comfy walking shoes to dinner. Along with understanding where you are from front to back on the ship, you also need to know which side you’re on – and as on any ship, the terms ‘right’ and ‘left’ aren’t going to help you much. 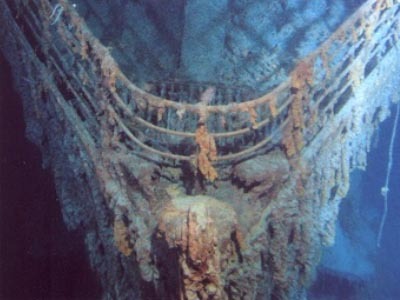 Instead, you need to remember that PORT is the left side of the ship and the right side is called STARBOARD. I’ve heard a few tips on how to best remember these – easiest for me was to note that the words ‘port’ and ‘left’ both have four letters each and both end with the letter ‘T’, leaving ‘starboard’ to be the right side by process of elimination. Since both sides of the ship tend to look identical on decks where the staterooms are located, remembering if yours is on the port or starboard side is definitely helpful. 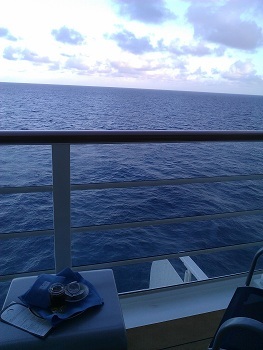 Now if have a stateroom with one, you may already know that what you’re sitting outside eating your breakfast on while you enjoy the view of the ocean every morning is called a VERANDAH, not a balcony. Why? I’m not sure – but that’s what it’s called on a Disney cruise ship. However, I do know that it’s my absolute favorite place ever to enjoy breakfast or watch the stars at night. And oh yes, here’s a bonus for you if you’re sailing in the Bahamas and stopping at Disney’s own private island – it’s called Castaway Cay, and that’s pronounced ‘key’ (as in rhyming with ‘bee’), NOT ‘kay’ (as in rhyming with ‘may’). So now you’re all set to sound just like an expert when you head out on your first Disney cruise and begin experiencing the magic for yourself. There are four ships to choose from – the Disney Magic, Disney Wonder, Disney Dream, and the newest ship that I was fortunate to sail on recently, the Disney Fantasy. Deb is Traveling Mom’s Social Media Manager and writes as West Michigan TravelingMom, as well as at Just a mom’s take on things…. You can also find her on Twitter – she’s @DebMomOf3. This cruise was a press event and working retreat for the Traveling Mom blogger network, and I was hosted for free. All photos were taken by myself with an HTC Rhyme smartphone camera. Deb is Director of Operations for TravelingMom.com and the mom of 3 teen and tween girls. 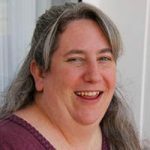 She lives in the greater Grand Rapids area in West Michigan, and is a former city planner and GIS (Geographic Information Systems) Analyst who loves gadgets, maps, writing, and traveling both within and outside of Michigan. She also enjoys reading, running and knitting. You can follow her thoughts and drama-filled adventures at Mom of 3 Girls. Excellent article and easy but important stuff every first time cruiser needs to know. Great info! I was surprised at how quickly I picked up the terms for the various areas around the boat – er, ship – it all made sense once we were on board.